I don’t expect the Fed to raise the funds rate this year. I don’t think Bernanke and the boys (and girls) could if they wanted to – there’s too much cash in the system and insufficient balance sheet to take the reverses. Moreover, I don’t think they will want to. Regional fed presidents might follow Hoenig into dissent, however I doubt that they’ll have an impact. Buy those dips. 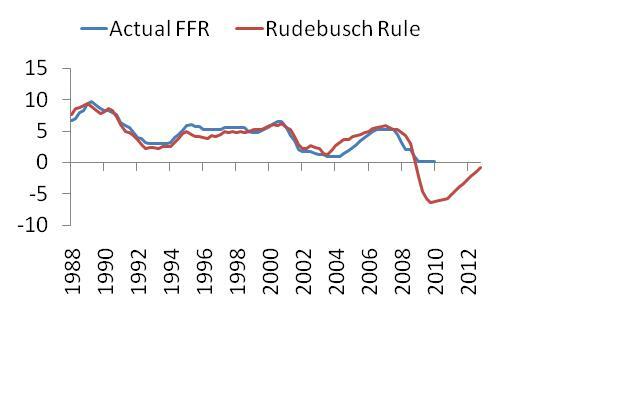 The reason I feel so confident on this is that I have copied the work of SF Fed Rudebusch – therefore, I can see that the most recent Fed forecasts imply a negative funds rate across the entire forecast period (out to the end of 2012). 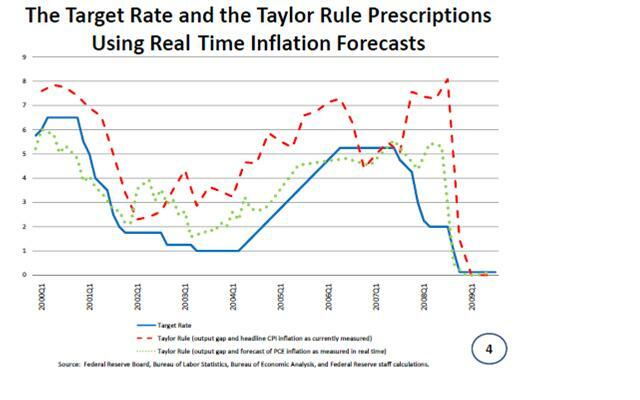 There has been a lot of talk about the Fed and the Taylor rule of late, beginning with the FT’s Guha who noted that the Taylor rule chart in Bernanke’s AEA speech showed a tiny tick off the baseline. This was used by some to suggest that the Fed was close to raising the funds rate – a proposition which was given short shrift at the time, but has gotten additional credence following Fed Hoenig’s dissent at the January FOMC meeting. So, was Hoenig’s dissent a reflection of some substantial upgrade to the Fed’s forecasts – as foreshadowed by Bernanke’s AEA speech? I doubt it. We’ll get the Jan forecasts when the minutes are released (17 Feb), however it seems improbable that the Fed might have improved their forecasts so dramatically in such a short space of time. 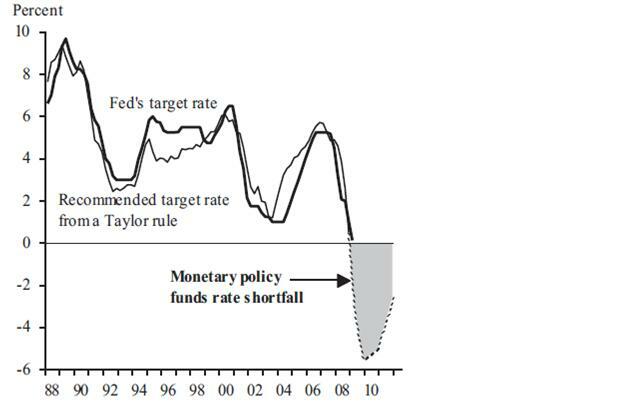 We don’t have all the fed forecasts required to recreate the Bernanke’s Taylor rule, however we do have an alternative solution – given to us by SF Fed Rudebusch in his paper The Fed’s Monetary Policy Response to the Current Crisis. 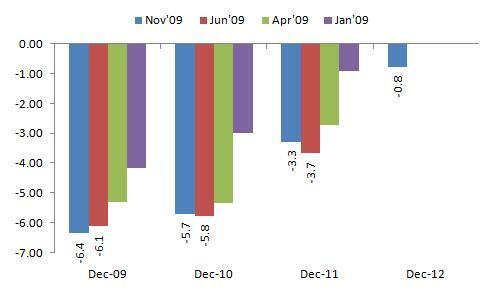 Using the Fed’s April forecasts, he projects a minimum optimal funds rate of -5.5% in December 2009. Extending this method using the Fed’s forecasts from the November meeting, yields a minimum optimal rate of -6.4% (90bps below Rudebusch’s original estimate). If we use Rudebusch’s yardstick to measure the development of FOMC forecasts, the Fed has been getting further from lifting the funds rate, but more optimistic about the medium term outlook. My guess is that the Fed will soon begin worrying about proper deflation. They should be very worried. 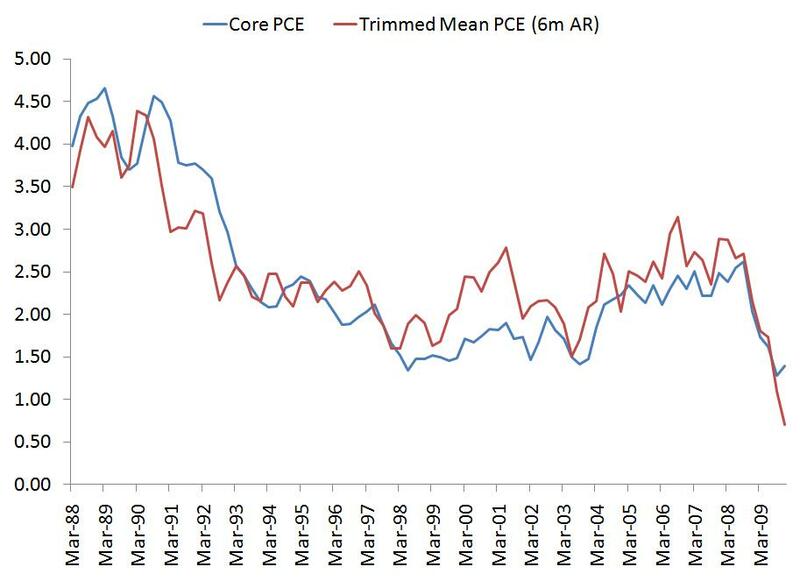 The Dallas Fed’s trimmed mean PCE shows the current 6m AR at +0.8%y/y, and I expect that this will fall to +0.7%y/y when the Dec PCE report is released. The 12m rate is 1.25%. By comparison, when Bernanke’s made his famous helicopter speech in 2003, the 6m AR bottomed out at 1.5%, and the 12m at 1.8%. 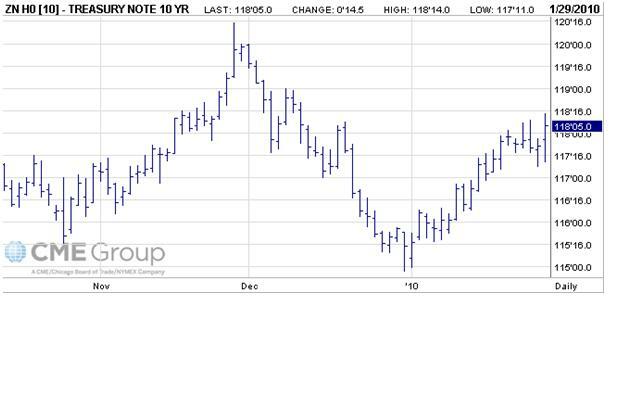 The CFTC data shows that the market is very short notes, and i think they are good to trade back up to 120 (friday’s close 118*10) as the market gets it’s head around that 1/ the fed is on hold for ages and 2/ that the deflation fight is looming. i think friday night showed that risk reward is with longs – bad data does not allay fears about the brewing trouble in europe (greece is in meltdown with debt at 100% of GDP, trend nominal gdp in good times of 7%, current yields at ~7%, and 40bn to roll). 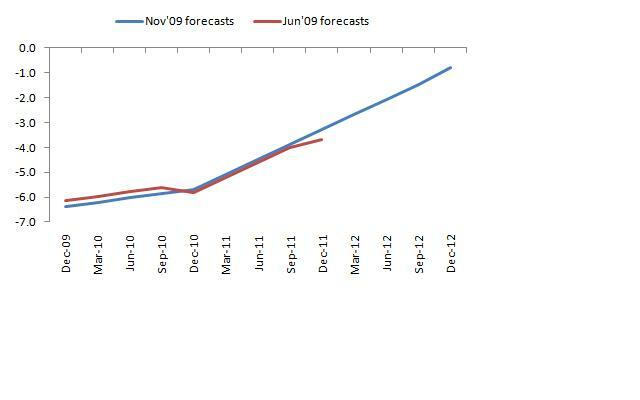 a nasty ISM or payrolls number, and we’ll be off the the races. Excellent post, clear and explanatory. Thanks and welcome.